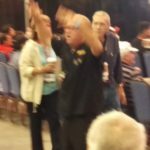 We had the pleasure of attending the first day at the annual Mecum auction held in Schaumburg yesterday. Lots of bidders and about 800 cars to go on the block. As a colleague and I deducted, this auction is very much for the dealers and private auto sales folks to enjoy and benefit from. 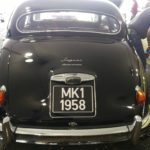 Many oldies were up for auction, probably some that came out of estates (90s Cadillac models), and collector cars worth more in nostalgia than price. With their new affiliation with Dodge, Mecum shows in several parts of the country. We understand the Mecum auction in Indianapolis at the end of May every year is the one to attend, with many cars up for sale. 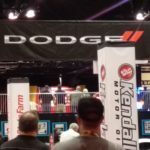 Thanks to Dodge who hosted the media at the Schaumburg Convention Center, we enjoyed admiring the cars for sale, listening to the auctioneer move the prices upward, and just people-watching. The gates open at 8:00 A.M. Thursday, Friday, Saturday (October 6-8), the auctioning beginning at 1:00 P.M. on Thursday, and 10:00 A.M. on Friday and Saturday. Be sure to take a look at the Wall Art gallery, beginning at 8:30 A.M. on Friday and Saturday. Could we have bought a car or two? You bet!! Iâ€™m sorry now but canâ€™t handle the 3 Iâ€™ve got!! Go on over to the Schaumburg Convention Center on Thoreau Dr. to take part in the energy and fun at Mecum, You wonâ€™t regret it! Friday Oct 7: Fifty-percent discount to all those seeking Admission and Bidding Registration if wearing Blackhawk-themed attire. Parking: Free with shuttle, from Firestone Tire at 1755 E. Golf Rd.